I had a little trouble at the beginning of the week figuring out a good way to intro a cocktail that includes both gin and chocolate flavors. I really shouldn’t have had trouble at all. It’s easy, the Alexander is simply delicious. The gin is there, but it’s tempered by the cream and creme de cacao. The chocolate flavor is present but not overpowering. So, how do you get the right balance? Let’s discuss just that. My first mix of the week I reached for Plymouth gin. The results were good, great in fact. However, the gin was much lighter than I would have liked. In fact, as I noted during my tasting, I wouldn’t guess that there was gin in there at all. Thankfully that’s a very easily corrected problem. Next I pulled down a bottle of Leopold’s, a gin made locally in Denver. Leopold’s had a stronger juniper flavor and is generally a bolder gin all around. With this choice the gin takes a much more starring role. 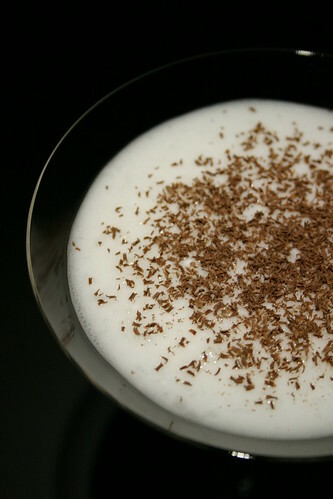 The resulting flavor blends the herbal qualities of the gin with the earthy flavor of the chocolate. All mellowed by the smoothness of the cream. Very tasty. Slight problem. I’m guessing most of you don’t have a bottle of Leopold’s on your shelf. Not to say you shouldn’t. A more mainstream gin that has a similar flavor profile is Tanqueray. This option works extremely well, too. To sum up the gin discussion, pick something bold. Anything else will be covered up. A common response when I mentioned that I was mixing up the Alexander has been “Oh, the Brandy Alexander.” I would then explain that the brandy version is actually a spin off of the original. I did try mixing one up though to find out what the fuss is about. Not surprisingly the Brandy Alexander is also quite tasty. Interestingly the flavor is almost like Irish Cream. This version lacks the intriguing complexity that I love in the original, gin recipe though. No matter what ingredients you pick, give this one a mix. You’ll enjoy sipping the result.